Vitalcare is delighted to announce the release of a low-cost small facility nurse call console along with a range of LCD displays for its IoT based Daisy nurse call system. We will also be exhibiting at the upcoming Australian Healthcare Week Exhibition at the Sydney International Convention Centre in March (27th to 28th), so please come along and meet our team and see the new system in action. Flora is a desktop console nurse call system designed for small facilities such as consulting rooms, aged care group homes, schools or institutions covering around 200 squaremetres. Flora supports wireless pendants, call points, bed mats, door security, out of bed sensors and reports call activations to a dedicated desktop console. It can also report to Vitalcares cloud based analytics engine Vitalcloud if required. Self-installed at under $5,000, Flora provides outstanding value for money. Vitalcare has just released a new range of colour LCD nurse call monitors to replace the traditional LED annunciators. These range in size from 10 to 32 inch (that’s 25cm to 81cm in the new money!) and are either desktop or wall mounted. 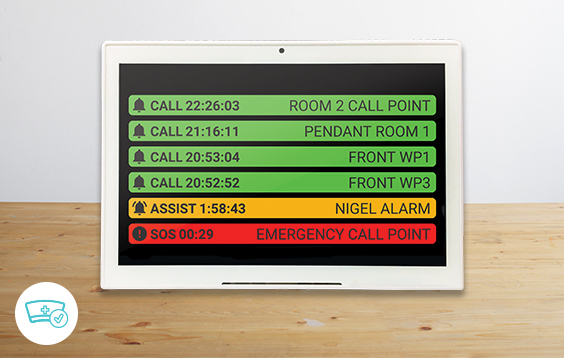 They can be configured to display single, multiple or scrolling alert messages with a range of alerting tones. Vitalcare will be exhibiting at the upcoming Australian Healthcare Week Exhibition on March 27 and 28 at the Sydney International Convention Centre. At the event, Vitalcare will be demonstrating and displaying some of our latest products and technological innovations. Be sure to stop by and see why we are the leaders in aged care technology. Should you need any more information on any of our products, please don’t hesitate to pick up the phone! We’d be delighted to talk to you about your nurse call system requirements and how Vitalcare can modernise your facility. Better still, come along to the Australian Healthcare Week Conference and Exhibition to see what we’ve got. We also have the world’s best giveaways! They are seriously awesome. Come see for yourself.